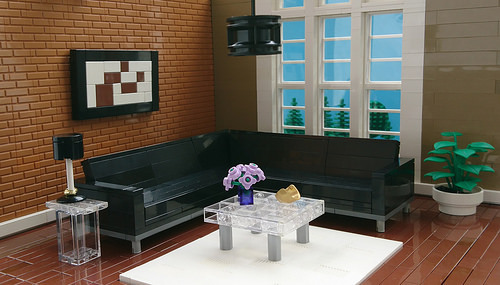 There are so many lovely details in Heikki Mattila‘s latest LEGO interior. The exposed brick wall and the painting provide a smart and stylish backdrop, and the glass tables look very classy. However, closer attention is rewarded with some lovely touches — a golden spaceman visor as a designer bowl, Gollum/Frodo’s precious ring adding lustre to the lamp, and Technic half-pins for the little round legs of the IKEA-style sofa. The best detail of all is perhaps a little lost, slightly washed-out in this image — don’t miss the use of grille bricks, partially inset into the floor, to create the effect of the white rug at the room’s centre.